The results of the pilot study concerning the use of half doses for vaccinating small dogs, conducted by Jean Dodds, DVM, and supported by the American Holistic Veterinary Medical Foundation, has been published. The results are exciting for those of us with small breed dogs. This finding was made only for the important canine viruses: distemper and parvovirus. Unfortunately, it is not legal to administer a half dose of the rabies vaccine. For more on the study, please read Dr. Dodds’s post. 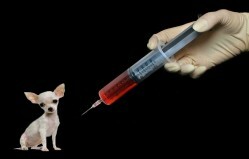 And click here for more on the dangers of vaccinating small dogs and cats. Please tell your veterinarian about these important findings. I’ll be writing more soon on new vaccination guidelines. Great information and thank you for posting this. Alivia, I completely agree. On top of that, it’s unlikely that most of the reactions were even recognized or noted. Conventional vets, like those at Banfield from where the data was taken, don’t recognize or admit to most reactions. How about cancer? Autoimmune disease? …. Thanks for posting this. Information like this can help us protect our smaller pups from unnecessary side effects due to using a greater dose than is needed. I look forward to more news on vaccination guidelines. Thanks, Jan! I will definitely check it out. Kimberly, they still have to do more testing and actual vaccines have to be tested to make it commonplace. This just gives innovative vets some cover. Well Dr. Dodds is really a good and thanks for posting this article about vaccine.